Okay so you’ve made your car plenty fast enough with a myriad of modifcations you learned about on v6mustangperformance.com, so how do plan to get that puppy stopped? Why consider brakes in your quest for speed? Brake systems are often the last modifcation a tuner looks at in their quest for speed. Often the goal is to make a car accelerate and corner better than anything on the road and the assumption is they’ll have plenty of time to stop if they find themselves in a sticky situation. Let’s face it, when you’re shooting the breeze with someone at the gas station, it’s highly unlikely that they’ll ever stop to ask “So how quickly can this baby come to a complete stop from 70 mph?”. People want horsepower and torque! There are variables however on the road and at the track that are completely out of our control. Like the old lady who should’ve given up the license 5 years ago that jumps out in front of you. Or worse yet, how about the car in the lane next to you at the strip that already has 5 car lengths on you that loses control? Unfortunately we can’t control other people’s cars. 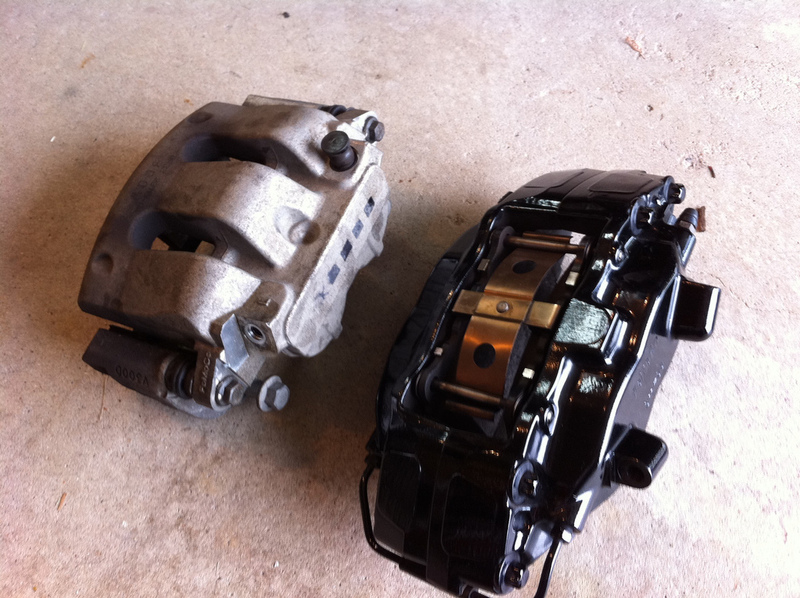 All brake systems and components have different characteristics and they respond differently from one car to another. Vehicle weight, heat, suspension mods, tires, the manner in which you apply the brakes, all effect the outcome of a vehicles ability to slow down or come to a complete stop. For most people simply adding a set of performance pads or upgrading the rotor size will make a world of difference. Other people who see a lot of track time may want to consider a full braking system that replaces the standard sliding caliper to a 4 or 6 pot setup. Fortunately the Mustang is a popular tuner car so the market is full of options. V6 owners could look for a take-off GT brake system and performance pads which will increase the rotor size. Where to look for a good set of brakes? 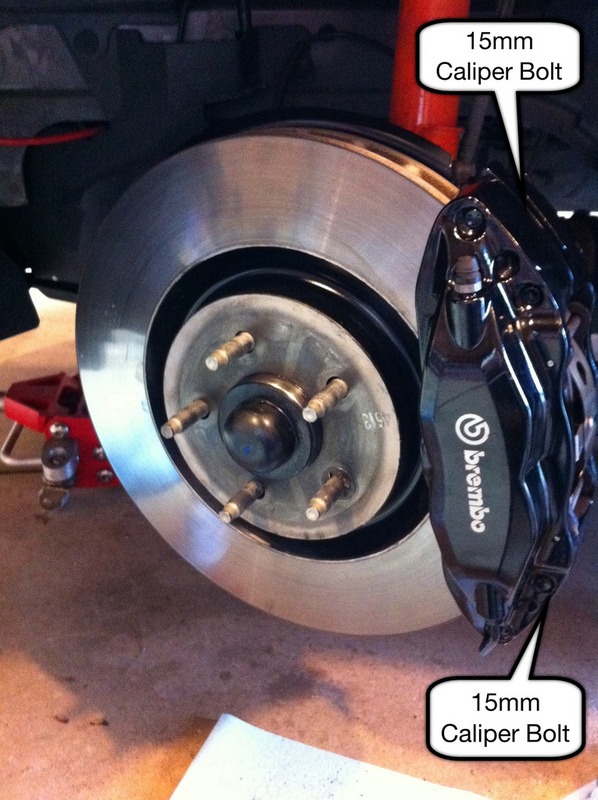 Recently I had the opportunity to pick up a set of Brembo take-off brakes from a GT500. 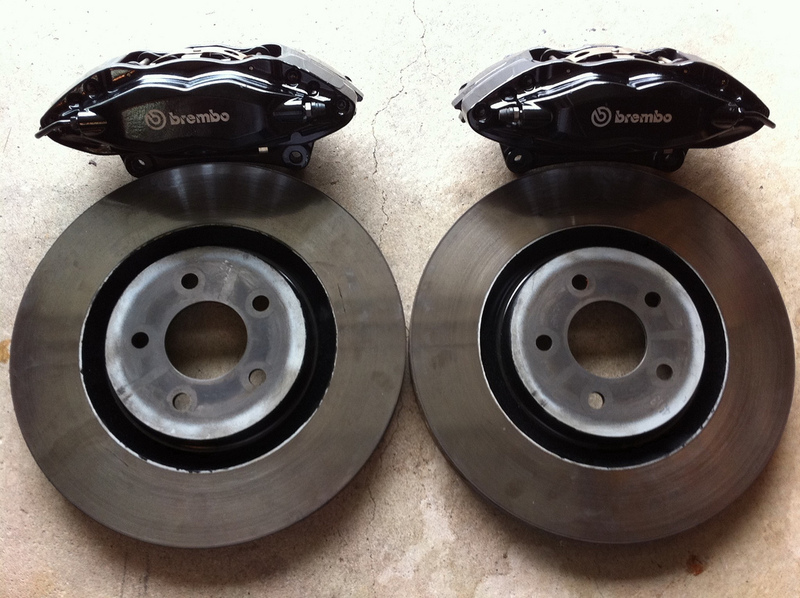 These are the same brakes found on the GT500 and GT (Brembo Option) cars. This system includes massive 14” rotors, 4 piston Brembo calipers, and high performance brake pads. These kits can be found at many places on the internet or eBay. FRPP dealers such as Late Model Restoration also offer this same kit new which includes a $200 set of stainless steel brake lines for both the front and rear in addition to rear performance pads. In this article I’ll be covering a quick visual comparison of the stock brakes vs. the Brembo kit. My car has the Performance Package so the rotors are the same ones found on the stock GT model however this system is interchangeable with the standard V6. 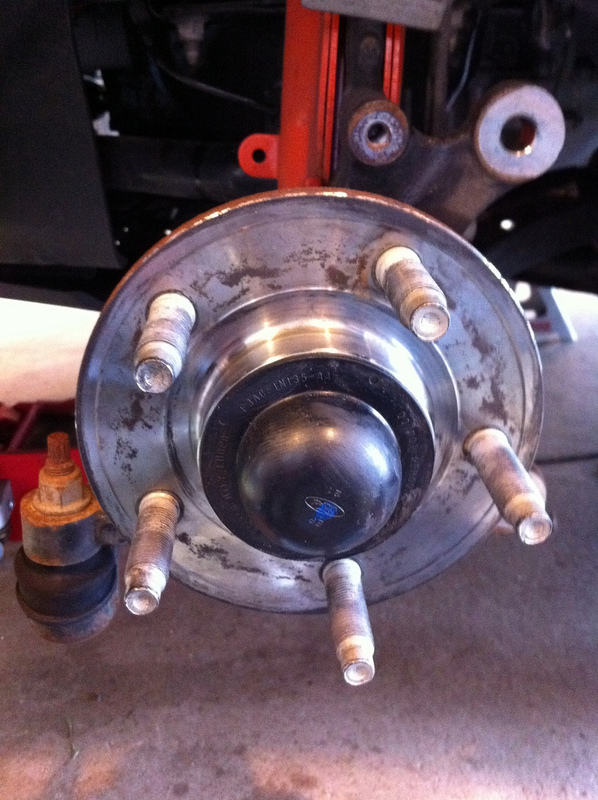 I’ll also walk you through the process of converting your stock setup to the Brembo kit. I’m not going to be providing measurable test data because quite frankly I don’t have the right equipment to do so. We’ll leave that testing to the experts. It’s relatively safe to say that in it’s stock form the 2011-12 3.7L Mustang already does a fairly decent job stopping, especially when looking at the Performance (Mayhem) Package optioned vehicles. To help put this in perspective you can simply look at the test data that’s provided by several of the top magazines. When you look at the test data for the V6 Performance Package Mustang it’s clear that the V6 peals off speed at an alarming rate. As shocking at it might seem, at first glance the V6 appears to fall within a group of cars that it would have had no business being compared to 10 years ago. Take a look at the data below which helps illustrate my point. 2010 Chevrolet Corvette Grand Sport – 154 ft.
2010 Lotus Evora – 153 ft.
2011 Ford Mustang GT (Brembo Track Package) – 153 ft.
2011 Ford Mustang V6 (Performance Package) – 152 ft.
2010 Porsche Cayman S – 151 ft. The Performance Package V6 already brakes slightly better than the Brembo Package GT. Well this demonstrates one of the variables I mentioned earlier. How does a V6 with stock GT brakes come to a complete stop one foot shorter than the GT with Brembo brakes? The answer is weight. In this case approximately 160 lbs. 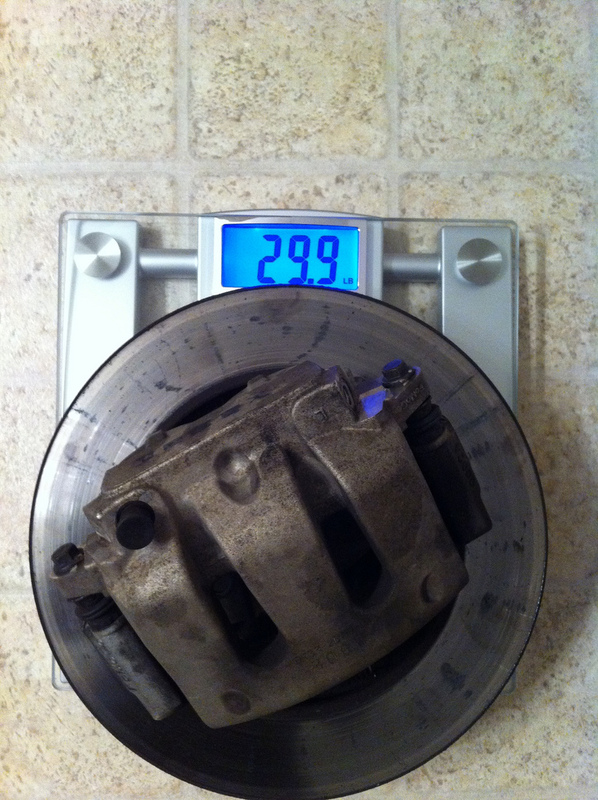 less weight on the V6. That plus the V6 Performance Pacakge wears the same sticky rubber as the Brembo GT. This makes you wonder how well the V6 could do with a set of it’s own Brembo brakes. The be fair, the test data can be a bit deceiving because just looking at a cars ability to come to a complete stop once from 70 mph doesn’t tell you how well the car holds up on a track. The stock V6 Mustang brakes are good and the V6 Performance Package even better but like many stock setups they’re prone to “brake fade” which will typically only reveal itself to the driver during continued high speed braking on a road course. The Mustang is somewhat large when compared to the likes of a Corvette, Lotus or Cayman. 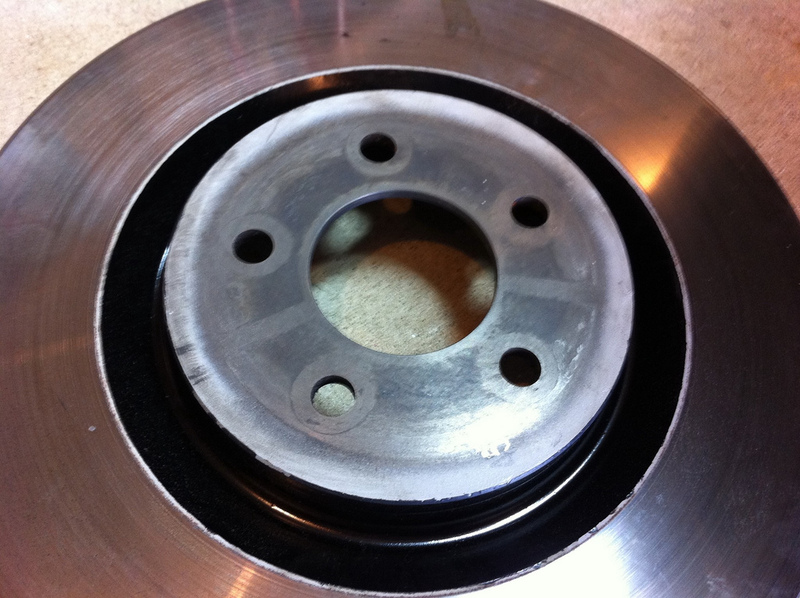 The increased weight under continued hard braking will quickly heat up the rotors and pads. The Brembo kits best feature is a larger rotor. 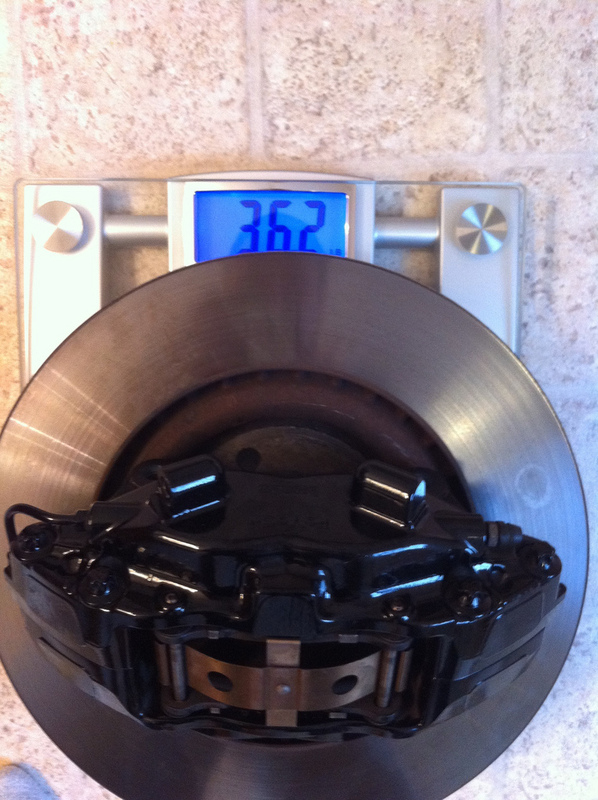 This is a comparison of the stock rotor (12.4”) to the Brembo rotor (14”). It doesn’t seem like much of a difference until you see it in person. The added surface area of a rotor helps to drastically dissipate the heat as it builds up. 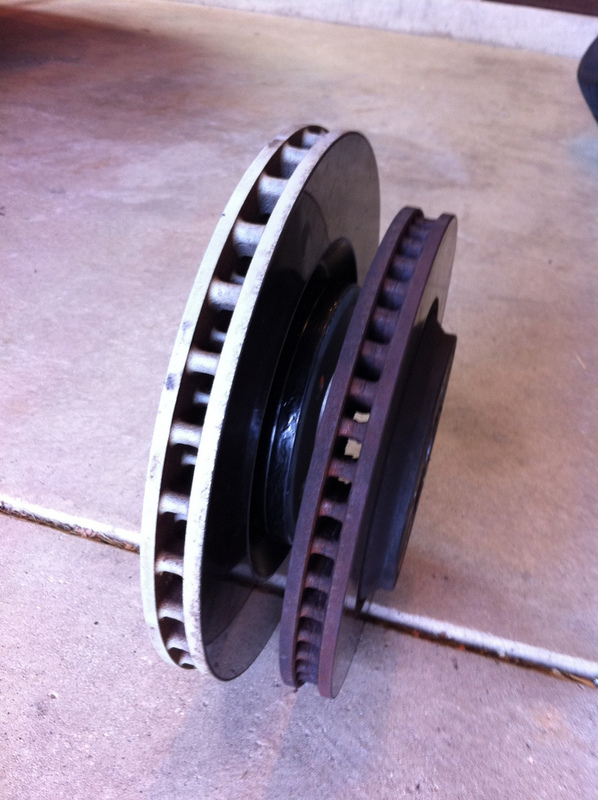 Rotor design is a critical component of your braking system. First, for the most obvious reason, it’s what the pad clamps onto. But the rotor from a certain perspective, acts like a radiator. The fins that separate the two sides cool the surface of the rotor as it’s spinning. By cooling the rotor you cool the pad. When brake pads are heated the resin inside of them that hold the material together start to break down. This leads to brake fade. 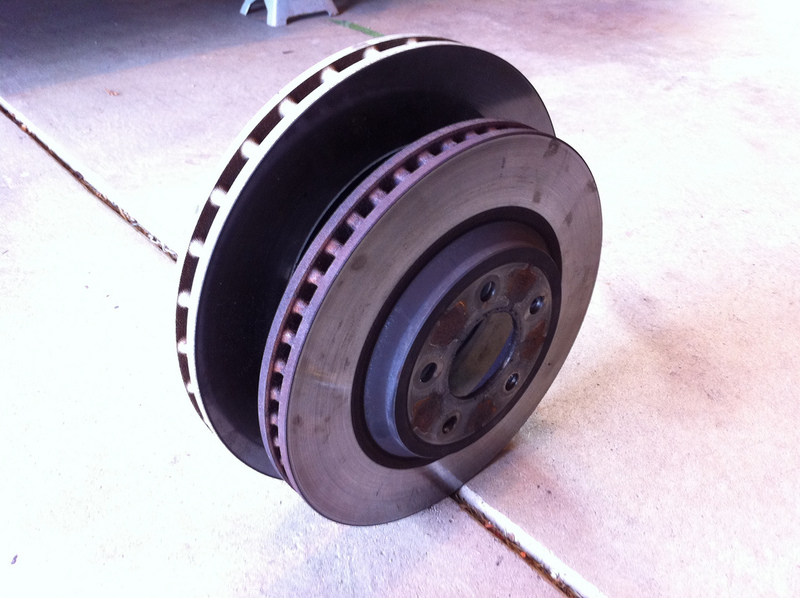 There are two common types of brake fade. One is where there pads reach excessive temperatures and the resins within the pad fail. This one is unpredictable because the pedal in this instance will typically remain firm but the vehicles ability to come to a complete stop is greatly reduced. The obvious risk here is that the driver might not notice the brake fade until they’ve already been formally introduced to the wall. The other type of fade is where the fluid in the lines has reached a boiling point. This one is easier to spot because the pedal will have a spongy feeling to it which acts as a warning to the driver. Enough rambling, just show me the install!!! First things first, the legal disclaimer. Brakes are obviously a critical component of your vehicle. They are the one thing that prevents you from becoming a red mark on the side of an old oak tree. Only attempt to work on your brake system if you understand the risks, feel confident in your ability to do the work proficiently and know what to avoid in order to prevent potential safety issues with you and your vehicle. This article is simply to show you what’s involved in converting your current brake system to a Brembo system. If you do not have the tools, skills and understanding needed to work on your vehicles brake system you should take it to a professional. A set of wheels capable of clearing the new brake calipers or a set wheel spacers with longer studs. 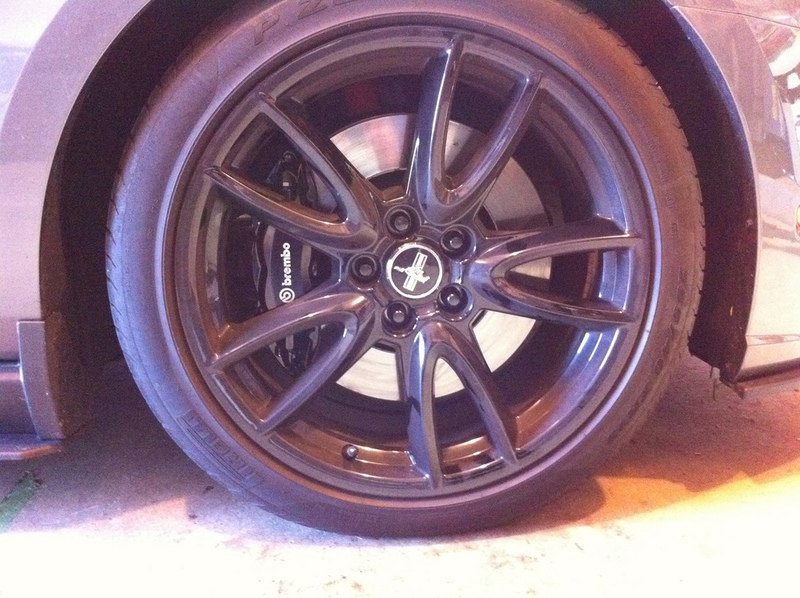 You can use either the 18” GT500 or FRPP’s 19″ Brembo wheels. Also you can search the forums for wheels that GT500 owners have used on their vehicles. I can tell you many won’t fit so make sure you’ve checked. Even the stock 19” GT wheels don’t have the clearance. STEP 1: If you’re doing this without an impact, slightly loosen your lug nuts now in order to allow for easy removal of the wheel once the front wheels are in the air. Just break them free, don’t do a full rotation of each lug nut. 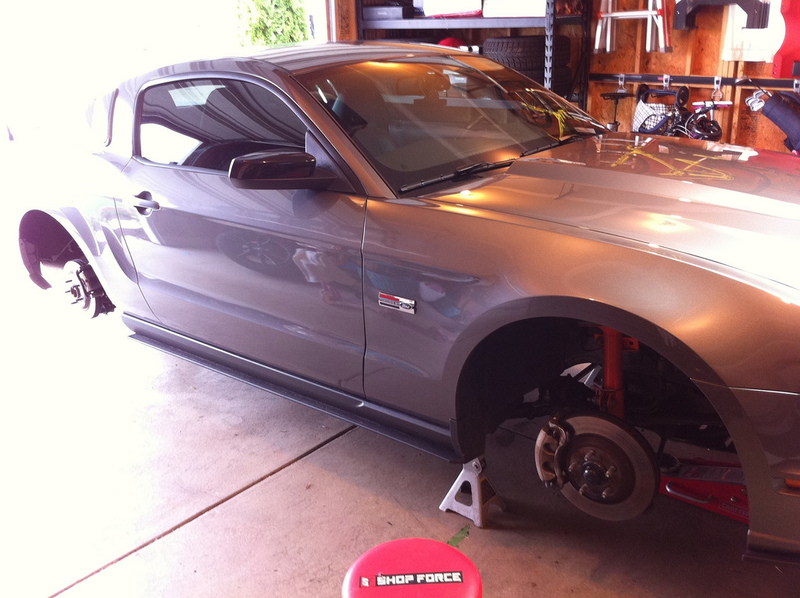 STEP 2: USING JACK STANDS, lift your vehicle to an adequate height to allow for the wheels to be removed. Place the jack stands in the appropriate areas underneath your vehicle. Please note that my picture shows the entire car being lifted. I did this in order to replace all of the fluid in my system. If you’re simply doing the front brakes this is not necessary. STEP 3: Remove the front wheels and move them to an area out of your way. 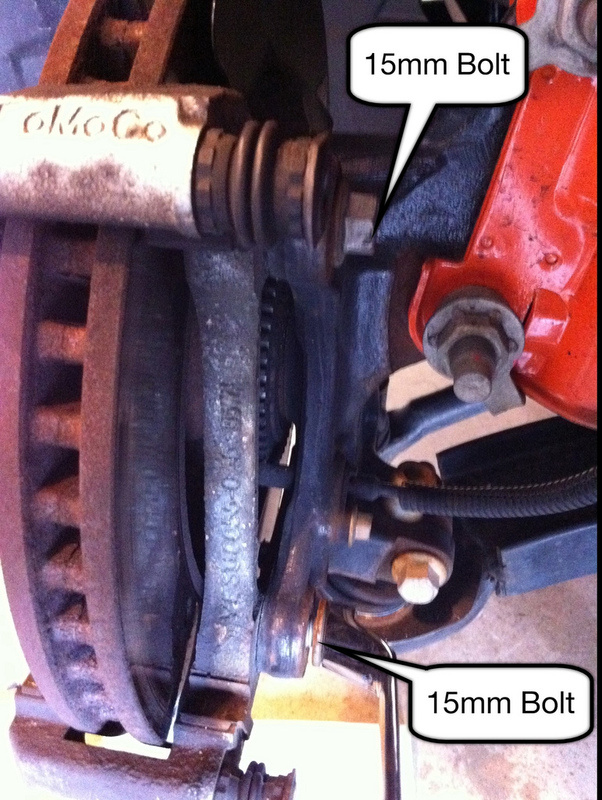 STEP 4: Using a 13mm flare-nut wrench, slightly loosen the brake line at the chassis (frame rail). It’s easier to do this before removing the 10mm bolt at the chassis (frame rail). STEP 5: Once you’ve loosened the 13mm nut, move to the bolt connecting the bracket to the chassis and remove it using a 10mm socket. Have a ¼” vacuum cap ready. Now fully disconnect the brake line with your 13mm flare-nut wrench and quickly cap the metal line to avoid losing all of your brake fluid. STEP 8: On the back of the caliper there are 2 bolts that hold the caliper to the mounting bracket. In this picture I’ve removed the caliper slide to show the bolts more clearly. This is not necessary but you’re welcome to do so if it helps to gain access to the bolts. Grab a breaker bar and 15mm socket to loosen the bolts. You can also use a long 3/8” ratchet and socket but it requires some effort as the bolt is torqued to 85 lbs/ft. 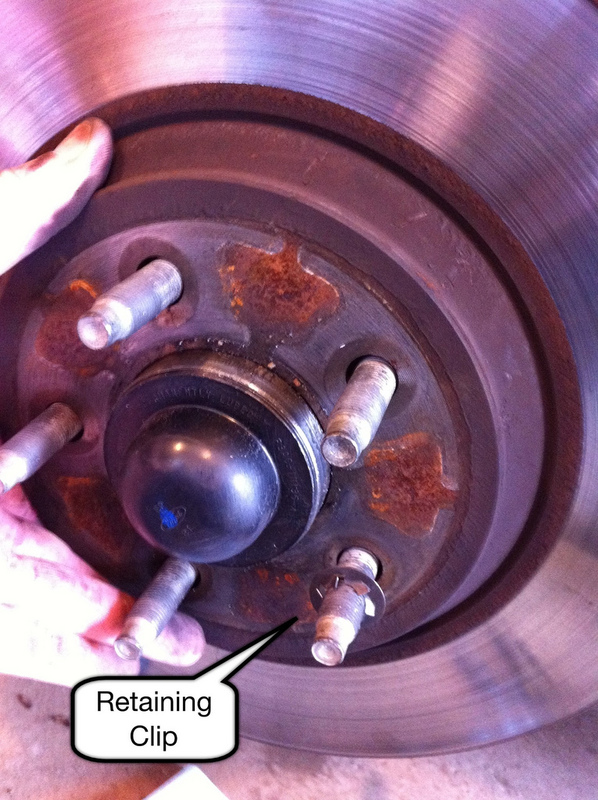 Once you’ve removed the bolts the caliper can be removed from the rotor. STEP 9: The rotor is simply held in place with a clip on one of the wheel studs as seen in the picture. These clips can be turned with a set of needle nose pliers and sometimes by hand. Remove the clip, then remove the rotor. 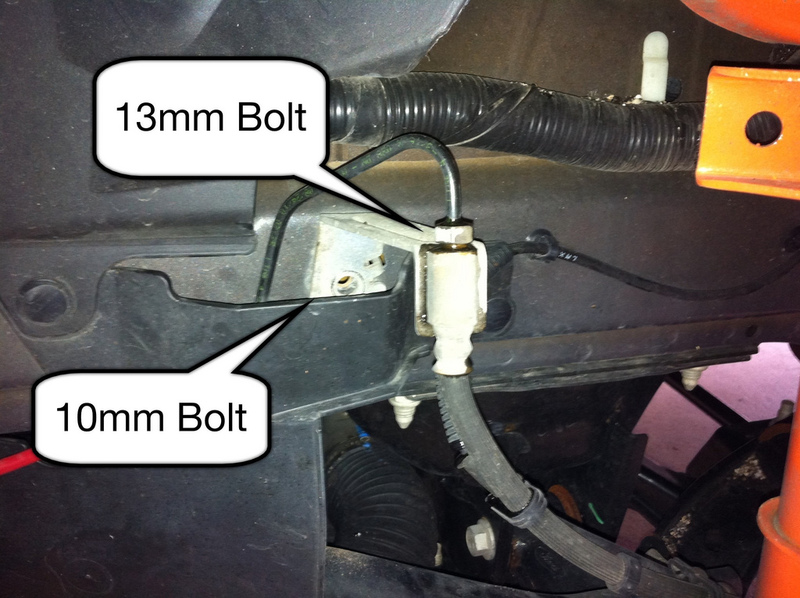 STEP 10: There are three bolts that hold the stock dust shield in place. I didn’t take a picture of these but they’re hard to miss. 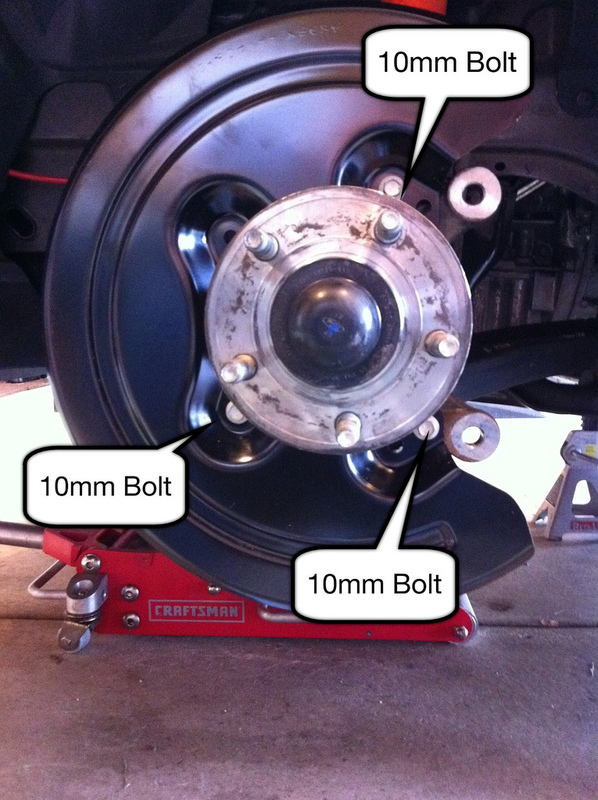 You can also look at step 2 of the Brembo install section below to reference the 3 bolt locations. Remove these bolts and the shield using a 10mm socket. 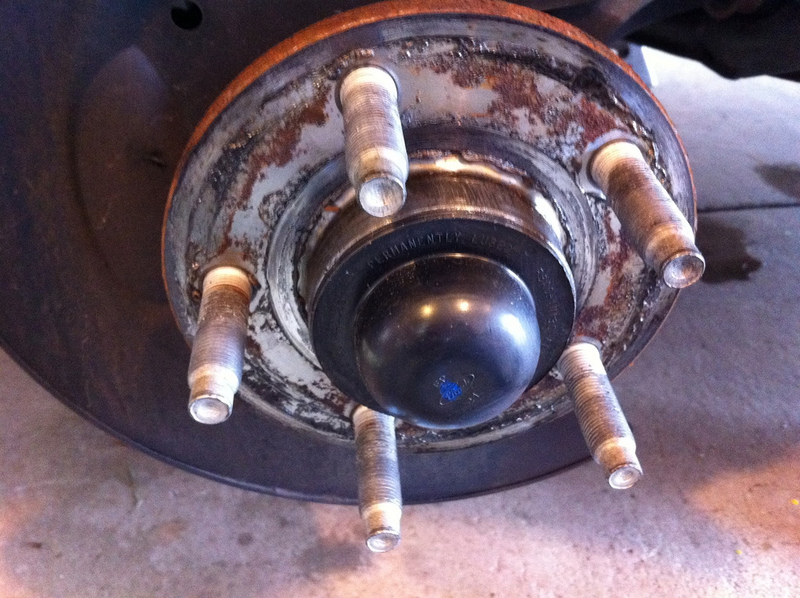 STEP 11: Using brake parts cleaner, rags, and a wire brush, remove all of the crud on the face of the hub. 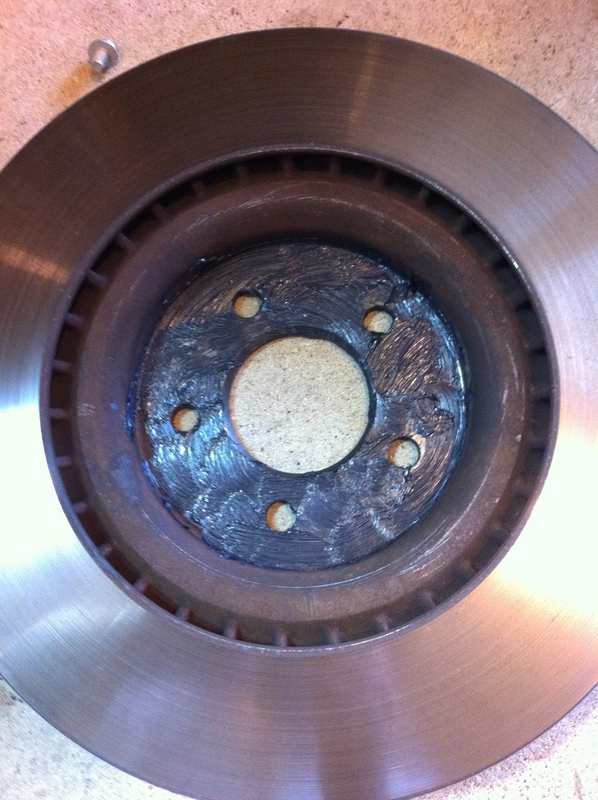 Also if you have purchased a take-off set of brakes, remove the crud on the inside/outside of the rotor. 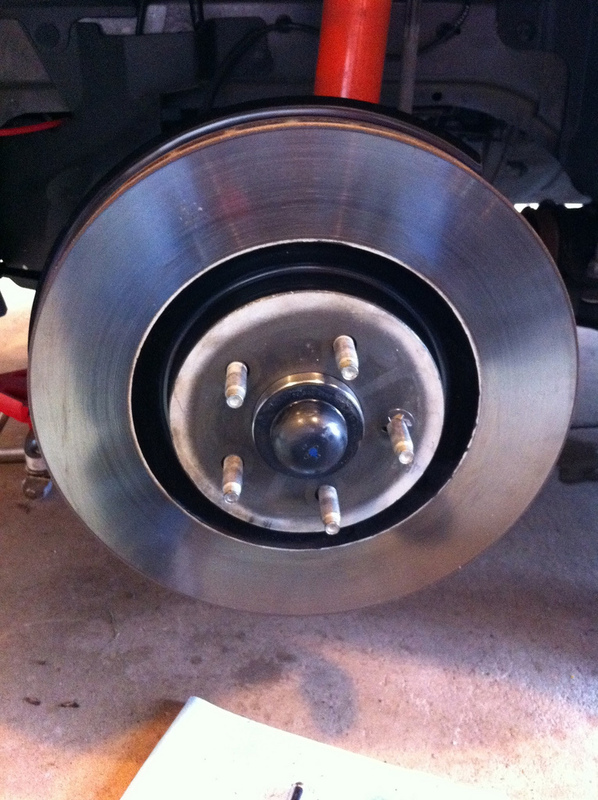 Thoroughly clean the face/backside of the braking surface on the rotor with your brake cleaner. You want to do this even on a new set of brakes. Here are some before and after pictures. 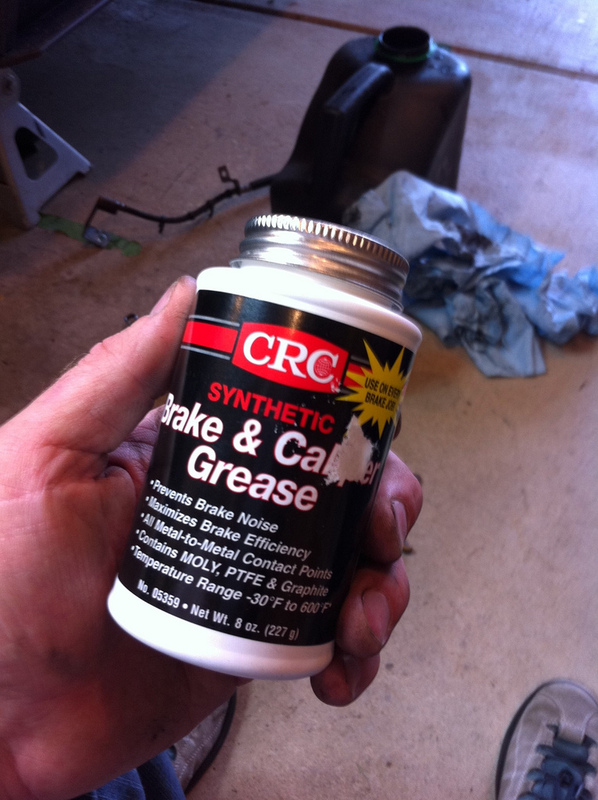 STEP 1: Using Brake/Caliper Grease, thoroughly lubricate the inside face of the rotor. STEP 2: Using a 10mm socket install your new dust shield with the bolts removed in step 10. If you’ve purchased a new set of brakes it should’ve included new bolts. Torque each bolt to 15 lbs/ft. Notice in the picture there are a couple different bolt patterns. Use the holes seen in my picture. STEP 3: Grab your new rotor and the clip used to retain it. Install the rotor and clip to hold it in place. STEP 4: Using the two anchor bolts removed in step 8, slide the Brembo caliper in place on the rotor and fasten it to the caliper bracket using your torque wrench and a 15mm socket. Apply medium strength Loctite to the anchor bolts. You need to torque these bolts to 85 lbs/ft. This picture simply shows the caliper in place. You’re attaching it to the caliper bracket referenced in step 8 of the de-install. There is a right and left caliper. Make sure your bleeder valves are pointed up. 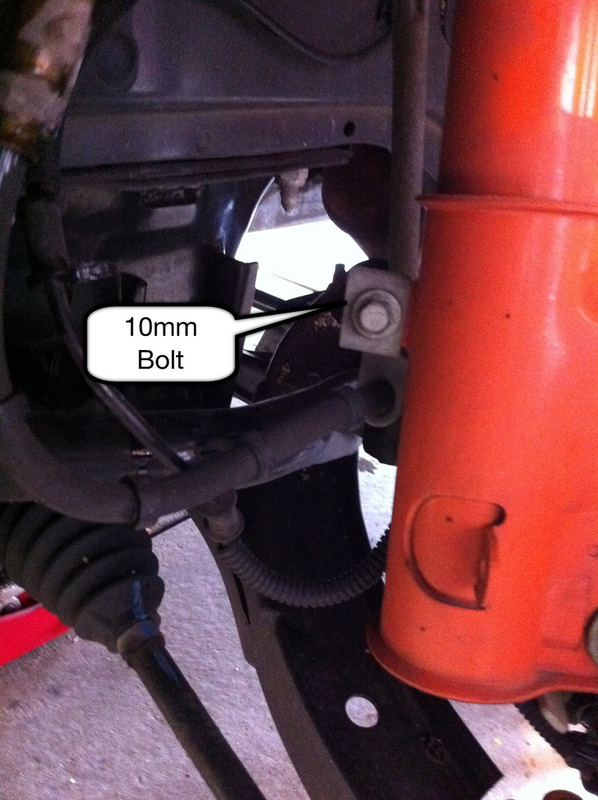 STEP 5: Using your new brake lines fasten them to the caliper with the 13mm flow bolt. 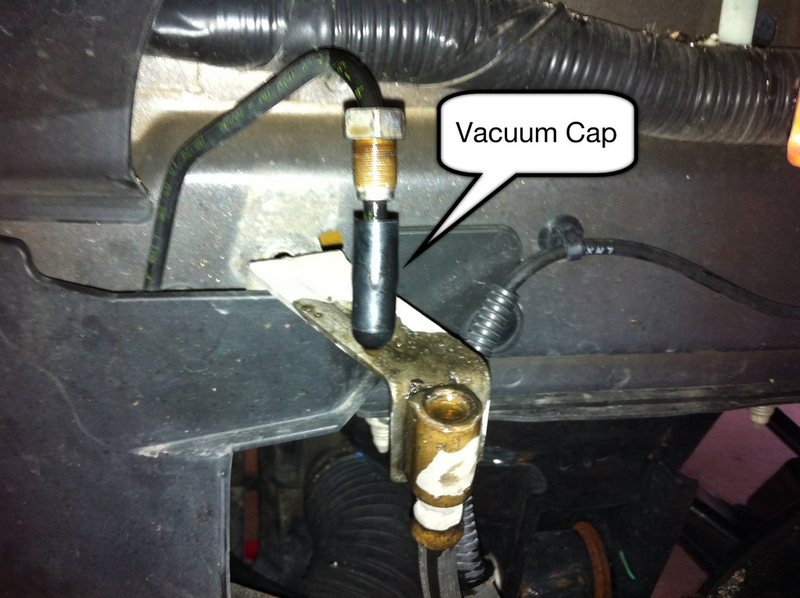 Make sure the bolt has the copper washer in place on each side of the bolt mount. This bolt gets torqued to 30 lbs/ft. This is the bolt on the bottom side of the caliper. 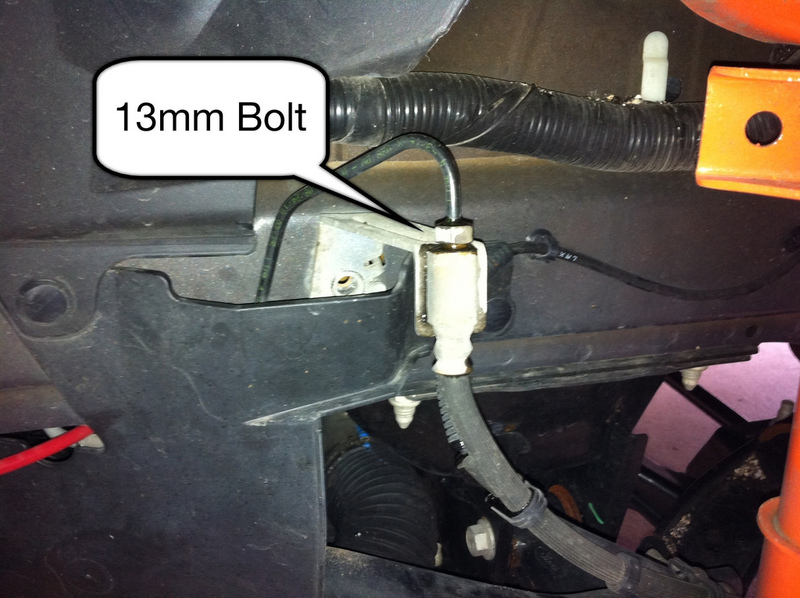 STEP 6: Re-attach the brake line to the strut mount using the 10mm bolt removed in step 7 of your de-install. Torque this to 15 lbs/ft. STEP 7: Remove the vacuum plug from the brake line at the chassis (frame rail) and then re-attach the brake line to the metal line. Do not fully tighten at this time, just enough to keep fluid from leaking out. STEP 8: With your 10mm socket re-attach the brake line brake to the chassis (frame rail) using the bolt removed in step 5 of your de-install. Torque the bolt to 15 lbs/ft. STEP 9: Now using your 13mm flare-nut wrench, torque the bolt between the hard and soft brake line to 15 lbs/ft. 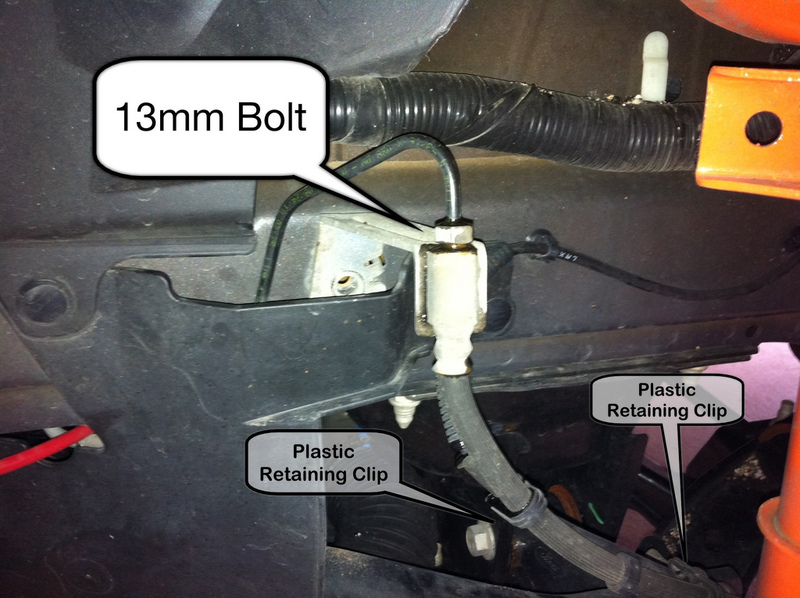 STEP 10: If you’ve installed new brake lines fasten them to the speed sensor. Typically stainless steel line won’t have the same clip that is found on the stock Ford line so you’ll need to fasten those with cable ties. STEP 11: Inspect all of your connections and bolts. Clean the lines and any brake fluid that may have dripped out. Inspect for leaks. Rotate the wheel fully in each direction to ensure no binding occurs and that the brakes are fully secured. STEP 12: It’s now time to bleed your brakes. There a many different ways to go about this and I’m not going to get into them in this article. Do yourself a huge favor though. By investing around $70 into a power bleeder like the one offered though Motive, you’ll save yourself countless hours of frustrations flushing your brake fluid in the future. This turns the frustrating practice typically done by 2 people yelling back and forth into a 1 man job that can easily be tackled in 15 minutes. The bleeder valves can be loosened and tightened using a 7/16″ socket and torque wrench. Be extremely careful to not over torque these. These should be tightened to 75 in/lbs. STEP 13: Re-Install your wheels. Torque your lug-nuts to 98 lbs/ft. Thoroughly check for proper clearance. STEP 14: Repeat on opposite side of vehicle. 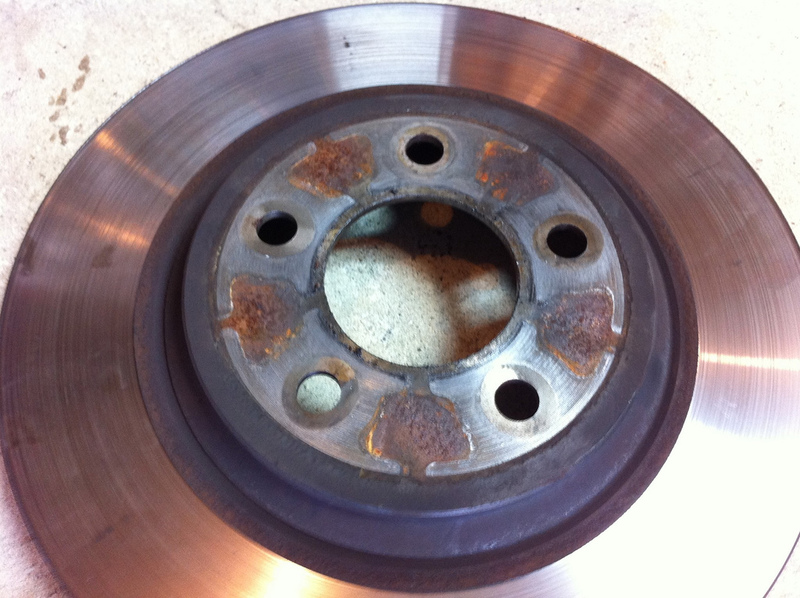 Enjoy your newly found stopping power!!! !